Acasta Midshipman under Capt. Kerr, c.1811. Francis Decimus Hastings entered the Navy, 19 Aug. 1807, as Third-cl. Vol., on board the Temeraire 98, Capts. Sir Chas. Hamilton and Edw. Sneyd Clay, successively stationed in the Channel and Baltic. In June, 1809, having attained the rating of Midshipman a few months previously, he removed to the Amethyst 36, Capt. Jacob Walton, with whom he appears to have been employed on Home service until wrecked in Plymouth Sound 16 Feb. 1811. He then joined, for a short period, the Acasta 40, Capt. Alex. Robt. Kerr ; after which we find him, until Aug. 1815, employed, on the Spanish, North American, Jamaica, and Home stations, latterly as Master's Mate, in the Iris 38, Capt. Hood Hanway Christian, St. Domingo 74, flag-ship of Sir John Borlase Warren, Emulous brig, Capt. Wm. M'Kenzie Godfrey, and Argo 44, and Ville de Paris 110, bearing the flags of Rear-Admiral Wm. Brown and Lord Keith. 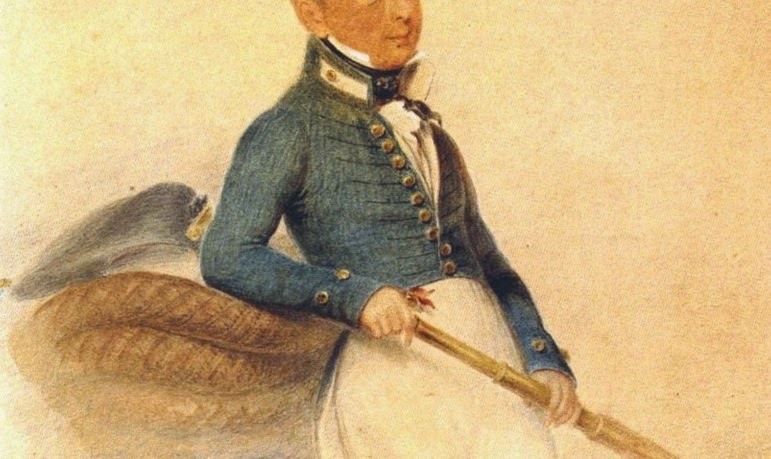 Above image is a cropped version of "Portrait of Augustus Leopold Kuper as a midshipman, in the year he entered the Royal Navy at the age of fourteen." by FISCHER, T. Paul. London: June, 1823.